If you follow this site (wow, your life) then you know that I am a big proponent of Lyft and especially when compared to Uber. Specifically, when I do use Lyft, I use their “Line” service because it’s economically sensible. And this is true for getting back and forth from New York City’s airports. In past posts, I’ve sung the praises of using Lyft Line around the city; whether New York and San Francisco as well as my experience taking Lyft to and from JFK, SFO and Las Vegas’ McCarran airport. Today, let’s talk about my experience with using Lyft to/from New York’s LaGuardia Airport in Elmhurst, Queens. My fares varied, but not by much at all as you can see in the above table. Yes, it’s only three rides, but the prices aren’t dramatically different. The average price for trip distance around 11-12 miles is approximately $32. Even at the more expensive fare, Lyft Line is much better than the metered fare you’ll get from NYC taxis. 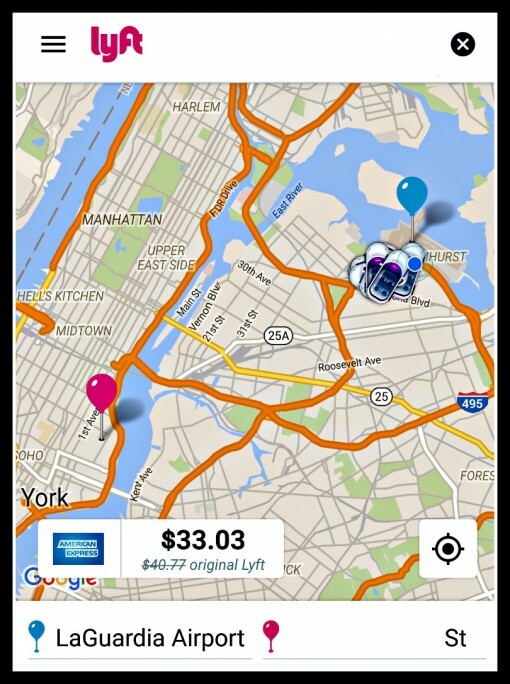 With taxis, you’ll never know what you’re going to end up paying, Lyft Line will tell you the cost right up front. And Lyft Line is much better than a $25 Super Shuttle which is unpredictable in duration. Fares are all about supply/demand at the time, but there are some choices to keep your Lyft fare low. First, use Lyft Line over a regular Lyft – that’s a 25%+ savings there. As we said, Lyft Line allows you to see the rate, but you don’t have to confirm. Begin checking fares as soon as you near the baggage area and you’ll get a good sense of the total cost of the fare. Request your Lyft Line and start the 10-minute match (when available) as soon as you’re done with baggage claim. Another great and surprisingly good option if you’re in Lower Manhattan is calling a car service from Chinatown (which runs anywhere from $30-35 from Lower Manhattan). I toggle between Lyft Line and Lucky Express depending on the situation. Between the,, you have two of the cheapest door-to-door options available to getting to lower Manhattan from LGA and getting from lower Manhattan to LGA. Make it cheaper to LaGuardia with this promotional code STUART12 and get you a total of $50 off code.